KATHMANDU, July 26: After months-long delay owing to power-sharing disputes within his own party and with the coalition partners, Prime Minister Sher Bahadur Deuba has finally inducted 19 new faces in his cabinet. The new ministers inducted in the cabinet on Wednesday include 10 ministers from the prime minister's party, Nepali Congress (NC), six from CPN (Maoist Center), two from Nepal Loktantrik Forum (NLF) and one from the CPN (Samyukta). The prospect of the Rastriya Prajatantra Party (RPP) and the Federal Socialist Forum Nepal (FSFN) joining the cabinet is almost over following the cabinet expansion, according to ruling party leaders. Earlier, Deuba had appointed three deputy prime ministers, one each from the NC and the Maoist Center and the NLF, and two ministers each from the NC and the Maoist Center. The prime minister, however, has yet to give full shape to the cabinet even after the expansion, leaving space for some fringe parties to join the government. Leaving a few exceptions including Giriraj Mani Pokharel of the Maoist Center and NLF leaders Jitendra Narayan Dev and Gopal Dahit, who briefly joined the previous Pushpa Kamal Dahal-led government as cabinet ministers, all those appointed Wednesday are new faces. Those appointed from NC include Meen Bishwakarma (Commerce), Mohan Basnet (Information and Communications), Ram Krishna Yadav (Agriculture), Mahendra Yadav (Drinking Water and Sanitation), Ambika Basnet (Cooperative and Poverty Alleviation), Bir Bahadur Balayer (Physical Infrastructures and Transport), Yagya Bahadur Thapa (Law), Bhimsen Das Pradhan (Defense), Sanjaya Kumar Gautam (Irrigation) and Rajendra KC (Youths and Sports). Among those appointed from NC include four from the Ram Chandra Paudel faction and one each from Krishna Sitaula and Khum Bahadur Khadka factions. While Ram Krishna Yadav, Thapa, Gautam and KC are from the Paudel faction, Pradhan and Basnet represent the Sitaula and Khadka factions respectively. Earlier, Paudel faction had threatened not to send any ministers if the faction was denied at least 40 percent of the portfolios under the NC's share. Deuba faction now holds seven of the total 13 portfolios. Three were appointed previously and four were appointed Wednesday. Those appointed earlier from the party include Gopal Man Shrestha (Deputy Prime Minister and Minister for Education) Gyanendra Bahadur Karki (Finance) and Farmullaha Mansoor (Labor). They are considered close to Deuba. Interestingly, Bal Bahadur KC, who was Paudel's choice for minister has not been included in Wednesday's expansion. Paudel faction has expressed strong reservations for not getting fair share in the cabinet and exclusion of KC. Although Prime Minister Deuba had assured Arjun Joshi a ministerial post, his name, according to party insiders, was removed at the eleventh hour to accommodate Mahendra Yadav. Ram Hari Khatiwada is also among the ministerial aspirants from the Deuba faction. 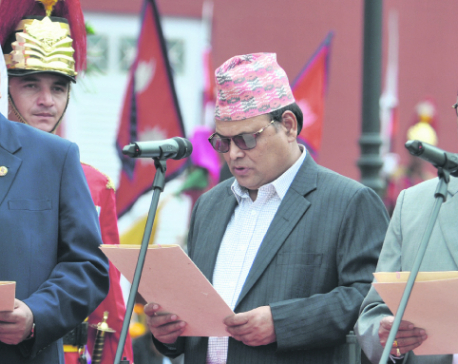 Similarly, those inducted in the cabinet from the Maoist Center include Giri Raj Mani Pokharel (Health), Tek Bahadur Basnet (General Administration), Shiva Kumar Mandal Kewat (Supply), Mahendra Bahadur Shahi (Energy), Aasha Koirala (Women and Children) and Santa Kumar Tharu (Livestocks). With this, the number of Maoist Center ministers in the cabinet has reached nine. Earlier, the Maoist Center sent Krishna Bahadur Mahara (Deputy Prime Minister and Foreign Minister), Janardan Sharma (Home) and Prabhu Sah (Urban) in the cabinet. On Wednesday, Prime Minister Deuba inducted Jitendra Narayan Dev (Culture, Tourism and Civil Aviation) and Gopal Dahit (Land Reforms and Management) from Nepal Loktantrik Forum Nepal. The party's chairman, Gachchhadar, is already serving as Deputy Prime Minister and Local Development Minister. Likewise, Prime Minister Deuba has inducted Mithila Chaudhary as Population and Environment minister from the CPN (Samyukta), a fringe leftist party. Sources close to the prime minister said efforts of ruling parties to bring the RPP and FSFN on board the government to ensure two-thirds majority support for the constitution amendment failed despite prolonged negotiations.